Most often, grapes are grown in long rows on the field enjoying the sunrays and summer rains. 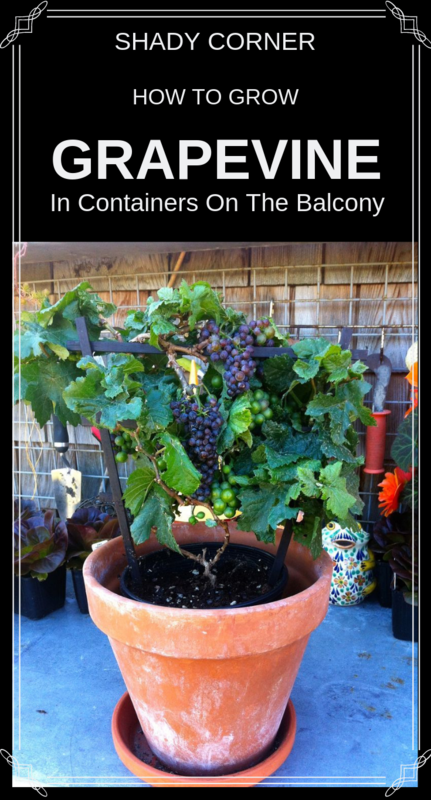 Although it may seem impossible growing grapevine in containers and on the balcony (if you are living in an apartment), you should know that this is not true, and there are many Americans, and not only, who are practicing this hobby successfully. What’s the point in growing grapevine on the balcony? Well, imagine yourself living on the 7th floor, let’s say, in a big neighborhood with a small green area oasis. Only imagine yourself staying on the balcony and enjoying your morning coffee, covered by the shady and pleasant smelly grapevine. True beauty! The pot doesn’t have to be too large: 50 cm in depth and 30-40 cm wide it will be enough. A larger pot can be used only if it’s placed on a well-consolidated terrace. For security reasons, on a balcony, it’s would be better if the pot is not too heavy. The pot can be made of plastic, wood or ceramic (ideal! ), but must have drain holes on the bottom. Which type of soil you need? Recipe I: celery soil (40%), manure (10%), sand (10%), peat (20%). Recipe II: celery soil (60%), manure (20%), sand (20%). Recipe III: celery soil (75%), manure (25%). Regardless of the chosen recipe, a layer of gravel or shards from a broken ceramic pot must be placed on the bottom of the pot to facilitate drainage. When and how we plant the grapevine? The optimal planting period is early spring (February-April). Use grafted varieties of frost-resistant varieties (you can find them in local merchants or plant store). A good solution is to use the strawberry cuttings. Even if grapes are not appreciated by everyone, the vigor and scent of autumn grape variety, makes strawberry the best choice in this case scenario. Ensure that the total weight of the pot (with wet substrate) won’t exceed 100-120 kg. Ensure that the total weight of the items on the balcony won’t exceed its support capacity. Make sure that the pot is well positioned and firmly fixed, preventing its falling.